A total of 14 races in various categories have been scheduled over two days after Friday’s practice and qualifying sessions. The MRF FF1600 class is becoming a four-driver contest involving Sandeep Kumar, Chetan Korada, Arya Singh and Ishaan Dodhiwala. 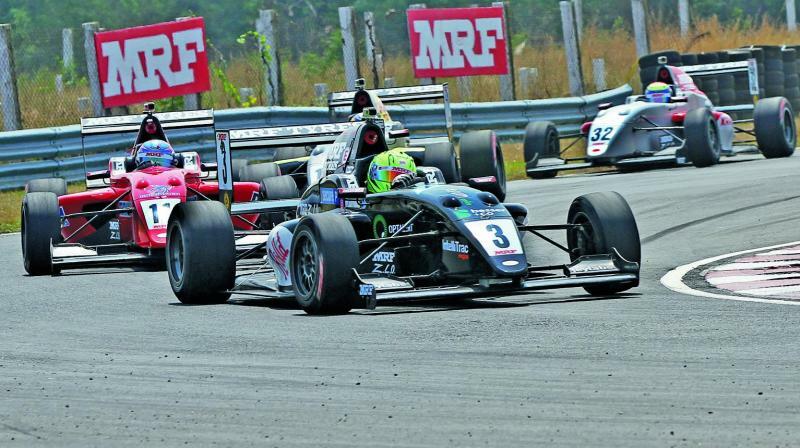 The MRF FF1600, which offers its champion a ticket to the prestigious Mazda Road to Indy shootout in the United States, will headline the fourth and penultimate round of the MRF national racing championship at the MMRT track in Chennai. A total of 14 races in various categories have been scheduled over two days after Friday’s practice and qualifying sessions. The second round of the national drag racing championship is also part of the main card and will be held on Saturday (practice) and Sunday (final) evening. Besides the MRF FF1600 which is among the quickest in country’s single-seaters, races in the premier Indian Touring Cars, which also highlights the weekend programme, the Super Stock, Indian Junior Touring Cars and the Formula LGB 1300 where two schoolboys, Arya Singh (Kolkata) and Yash Aradhya (Bengaluru) have excelled, are also scheduled. The Volkswagen Ameo Cup will be an added attraction with a grid of around 20 cars. In the four races thus far, last year’s Vento Cup first runner-up Karminder Singh has won two, and Sandeep Kumar and Dhruv Mohite one apiece to emerge as the front-runners in the championship stakes. The MRF FF1600 class is developing into an exciting, four-driver contest involving Bengaluru’s Sandeep Kumar (72 points), local challenger Chetan Korada (66.5), Kolkata schoolboy Arya Singh (52.5), who scored his maiden podium finish in the previous round, and last year’s Volkswagen Vento Cup champion Ishaan Dodhiwala (44) from Hyderabad. The quartet come into the frame as championship leader Anindith Reddy (117) with four wins in seven outings is ineligible for the Mazda Road to Indy shootout whose winner earns a scholarship of $200,000, as the cut-off age is 25 while the Hyderabad racer is 27. In contrast, the Touring Cars class has so far been a two-horse race. Defending champion Arjun Narendran (Red Rooster Performance) from Coimbatore has had a wretched start to the season and managed just one win in six races, four of which were taken by Bengaluru’s Deepak Paul Chinnappa (Race Concepts). The two have provided some top drawer racing marked by wheel-to-wheel racing. Equally competitive has been the Formula LGB 1300 that has sub-categories of Rookie and Student Cup. Two schoolboys, 16-year old Arya Singh from Kolkata and Bengaluru’s Yash Aradhya, only 14, have lit up this category by showcasing their talent and potential. Can Sunrisers storm Kings’ citadel?